This old survey map from the Linn County, Oregon Surveyor's office shows the land in Township 11 South, Range 2 West in Section 6 in Linn County, Oregon. Supplina Hamilton's (S. Hamilton) claim number 2969 is clearly visable. Some of his near neighbors are Joseph Earl and John A. Powell. Supplina first arrived at his land claim on September 3, 1851. 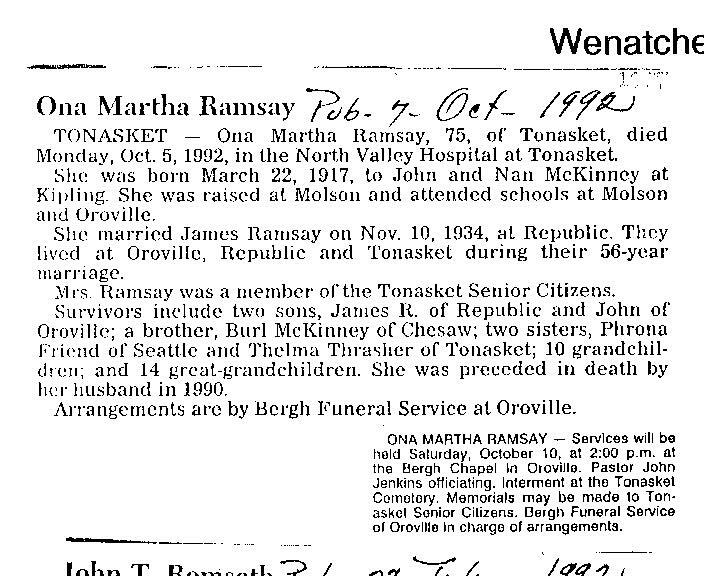 Ona Martha McKinney was the wife of James 'Jim' Ramsay. Ona and Jim were married in Republic, WA in 1934. Ona & Jim lived in Oroville, Republic and Tonasket. Ona's husband Jim was the son of George Ramsay and the grandson of James Watt Ramsay and Mary Adelaide (Spaulding) Ramsay who were pioneers in the Buckley, WA area and later in the Wauconda / Havillah districts of Okanogan County, WA. This page from the 1871 Washington Territory Census near Newcastle, WA has the names of John & Sarah Jordan and their two younger daughters, Eliza Ann and Martha. The girls two future husbands are also listed on the page, John Blonquist and Robert N. Canaday. The couples were married later in 1871. Martha and Robert were married 'at the coal mines' by the Rev. Daniel Bagley. Their older sister, Elizabeth had married Amasa Galloway a few miles north on Amasa's homestead in (what is now) Bellevue in 1870. This copy of an undated Albany Oregon newspaper article by Everett Earl Stannard was provided to us by Avis Reddway. The copy is a little difficult to read but well worth it. It gives some very interesting insights in to the place and times of Supplina and his close associates in pioneer day, Linn County, Oregon. The article features the story of the pioneer Linn County families of John Alkrie Powell and his brother Alfred. Oscar was a son of Duron Hamilton and Laura Brunton. Oscar and Minnie were widowed and this was their second marriage. Oscar Hamilton as a son of Duron Hamilton and Laura S. Brunton. Oscar was living with his family outside of Starbuck, Washington. 7) Our Family in Illinois: History of Menard and Mason County, Illinois. This is a large file (3.5mb) PDF file but very interesting. I've taken pages that help illustrate what life was like for our family in Illinois (Mason and Menard Counties) in the 1830's to 1850's. There are rich descriptions of the country, way of live and anecdotes of all sorts. Menard and Mason counties were originally parts of Sangamon County with the Sangamon River running through the area. Salt Creek Township, Havana and Sugar Grove are all areas that were familiar to the Hamilton's and the Judd's. Supplina Hamilton left for Oregon from Sugar Grove in Menard County in 1851 in the company of the Powel brother's (John, Alfred and Noah). The leader of the train was John Alkrie Powel. They passed through Havana as they exited. John Alkrie (J.A.) Powel was named for John Alkrie a local and noted Christian Church minister and family friend. John Alkrie Powel was also a minister and had a great influence on Supplina Hamilton. John Alkrie Powel married Supplina and Sarah Jane Sumpter in Linn County, Oregon in 1858. Many familiar families and names are mentioned in these pages. The history of the Alkrie family among them. The book also contains a history of the pride of Mason County the 85th Infantry that mustered and marched off to the Civil War in August of 1862. The 85th served in the Atlanta campaign under General Sherman and disbanded and returned to Illinois in June of 1865. Supplina Hamilton's younger twin brothers, James and William McCord Hamilton are mentioned by name and rank. James is mentioned three times as he was promoted to Sergeant then Second and then First Lieutenant. William McCord Hamilton held the rank of First Sergeant. William was wounded in the summer of 1863 and James was captured during the fierce battles of Peach Tree Creek, Georgia (near Atlanta) on July 18 & 19, 1864. Both of the twins survived the war. Here's an interesting thing: On the bottom of page 231 and top of page 232 there is a discussion of the founding of the Presbyterian Synod at Sugar Creek. One of the founding Elders (or 'presbyters') was John Hamilton. One of the licentiates present was William McCord. The author puts the date at 1828. This would be too early for our John Hamilton as he didn't arrive until least 1830/1 (as he was in New York at the 1830 Census). Anyway, it is possible that the author doesn't have his dates exactly right. It appears that author may be off significantly on other dates. For instance on page 538 the author mentioned that John Powel's home was rebuilt by a new owner in 1840 as he had, 'Moved to Oregon.' 1840 would have been an early date for him to have crossed the Oregon Trail. We know that John A. Powel lead his train to Oregon in 1851. I'm doing more research on this to see if he's refering to J.A. Powel's dad (not likely). Anyway, let's go back to the mention of elder John Hamilton. It's interesting that John Hamilton is mentioned with his fellow presbyter, William McCord. Supplina's father John Hamilton named one of his twin boys, born in 1834, William McCord Hamilton. There is no other known 'McCord' relationship in the Hamilton family. The Irish name, McCord, is always a surname not a given name. The fact that he was named William McCord Hamilton strongly suggests that he was named after someone with the last name of McCord. This large 45 page PDF document (8.7mb) will be of special interest to the Marvin Vernon Hamilton family. Marvin's wife was Julia Grace Dykstra. Julia's mother was Delta Mae Parrish and her father was Henry Juryen Dykstra. This document contains copies of pages from a Parrish family history and also includes type written pages of Dykstra family genealogy. Pemiel and Lucy Pooler were the parents of Jemina Pooler the wife of Supplina Judd (Sr.). Supplina and Jemina were the parents of Altha Judd the wife of John Hamilton. This group sheet was provided courtesy of Joyce Hamilton. Linked are pages from the wonderful book, Trails and Tales of the early-day settlers of North-Eastern Okanogan County. Here is the record of the 'Amos Jordan' family. The author made a bit of an error. The father's name was William Jordan. Amos was his oldest son. The mother's name was Mary. William was a brother of Elizabeth Jordan who married Amasa Galloway. The Galloway's also lived in Wauconda in this era and are recorded in this book. Amasa and Elizabeth were the parents of Charles Amasa Galloway who was the father of Elsie Luetta (Galloway) Hamilton. In this account, we learn insights about the Jordan family including the account of Clarence and Ollie's amazing gold strike in the Cascades near Liberty by Blewett Pass. In the Seattle Central Library I found this article in the Illinois State Genealogical Quarterly V. XIII, No. 2, Summer 1981 p. 61 that is a transcription of the store customer records from the Gordon and Thornton Company in Shelbyville, Illinois between 1835 and 1836. It lists goods, prices and information about the store along with customer accounts. Robert Templeton and his son John are listed as customers. It was John's son, Greenberry Templeton who married Nancy Jane McCarty and emigrated to Oregon. Two of Greenberry and Nancy's daughters married sons of Supplina and Jane Hamilton, Judd and Frank. It's amazing to think how our decendants in future generations will understand how we lived by reviewing the records of what we bought on credit and debit cards and with checks. Note: There is a John Hamilton also listed as a customer, but he is likely not a relative. In 1910 seven year old Elsie Galloway was living in Wauconda with her Galloway Grandparents, Amasa and Elizabeth. Her mother was remarried and living in Grande Prarie, Alberta and her father, Charles, was remarried and living with his wife in Republic, WA. In the tiny town / precinct of Wauconda were the Ramsay men, the sons of James and Mary A. (Spaulding) Ramsay who were farming. They are listed without their families... who may have been living in Tonasket or in near by areas at the time. Samuel and Walter Gilbert were in their early 20's when they married Pirena and Effie Hamilton in 1894 and 1895 respectively. Samuel and Walter lived in Juliaetta, Idaho and were proving up homesteads they had claimed in 1893. Pirena and Effie were the daughters of Supplina and Sarah Jane (Sumpter) Hamilton. Reuben Bennett was a gospel preacher and quiet evangelist who left his home in Australia to come to America in 1923 to labor in the ministry. Most of his ministry was in eastern Washington. Reuben was to meet Maurice and Elsie Hamilton and their family in Tonasket in the 1930's and his kindness and faith was a tremendous inspiration to them. As Reuben's ministry was traveling and itinerant he and his fellow ministers would regularly stay with the Hamiltons. 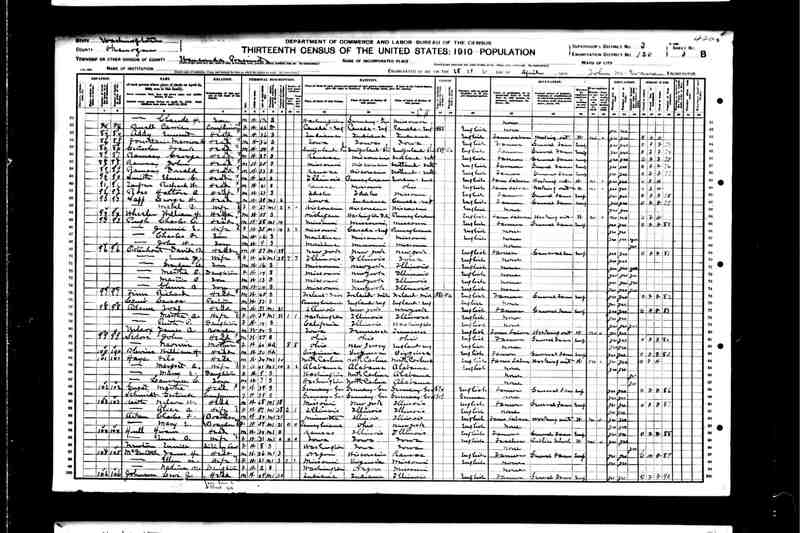 This link is to the 1930 US Census page that records Reuben. He is 35 years old and listed as a 'lodger', at this moment in time, with Elbert and Lillie Leathead in Meyers Falls, WA. Reuben's occupation is listed as 'Clergyman' and his industry is listed as 'Christian.' As a point of interest, Meyers Falls is now known as Kettle Falls as Kettle Falls was relocated upstream to Meyers Falls after the construction of Grand Coulee Dam in the 1930's. There are pictures on this site of 'Uncle Reuben' the gentle spiritual man who cared and laborered for the Hamiltons and many others. Reuben Judd, Sr. was the father of Supplina Judd, Sr. Reuben had three wives. Reuben married Elizabeth WHITE, daughter of Moses WHITE and Lydia BELLOWS (Elizabeth WHITE was born in 1741 and died on 9 May 1765 ). Reuben also married Elizabeth SMITH, daughter of John SMITH and Unknown (Elizabeth SMITH was born about 1750 and died on 31 Mar 1781). Reuben also married Submit GRAVES on 12 Dec 1784. Reuben fathered 14 children by these three wives. This page from the vital records ledger of South Hadley, Massachusetts only records the births of the children of his first wife, Elizabeth WHITE. He was said to have been a very lively and active person even in old age. Supplina Judd, Sr. was one of seven children borne by Reuben's second wife, Elizabeth Smith. There is a story here. Robert emigrated to a homestead near Cochran Grove in Ashgrove Township, Shelby County, Illinois in 1828. Apparently his wife Anna died soon thereafter in 1829 and is one of the first burials among pioneers in the area. This 1830 Census shows Robert without his wife. Here is mention of the Robert Templeton household in Ashgrove, Shelby County in this era: "Other pioneers in the neighborhood of Big Springs were Samuel Weatherspoon, Bazel Daniel, William Daniel, and B. Fancher, with their families, who settled there in 1826. In the fall of 1826 John Cochran, with his three sons-in-law, John, Daniel, and William Price, settled in what is now called Cochran's Grove. Mr. Cochran raised a family of five children. His youngest son James [Note: This James Cochran married Robert Templeton's daughter, Nancy C. Templeton in Ash Grove on July 9, 1829], who was thirteen years of age when they came to this county, is the only member of the family now living, and one of the oldest citizens now residing in the county. Other pioneers of Ash Grove township were John Frazer, Robert Templeton, Joseph Dixon, Robert Rankin, Daniel Green, John Bolin and John Storm." ... "Robert Templeton arrived in Section 4 of Ash Grove Township in 1828. This North Carolina native settled between two small tributaries of the East Fork of the Little Wabash River. The two streams were called Four Mile Creeks and the area became known as Four Mile Grove. " ... " The Cochran Cemetery in Section 7 of Ash Grove Township is the final resting place of one of the first people to die in Shelby County. Anna Templeton was buried here in 1829. Cochran, Sexson and Storm family members rest beside her." Rodney is the son of Arthur Lund Hamilton and Nelda Lee (Nugent) Hamilton. Ross' birth record was mis-recorded. He was born on this day in Endicott, Whitman County, WA as Wilbur Ross Hamilton. His father is correctly identified as Judd Hamilton. Roxie was the older sister of Supplina Hamilton. She married Able Cross in Morgan County, Illinois after the family emigrated from New York. Decendants of this couple remember the names as Roxa and Abel. 23) S Hamilton: Listed on the Union Ticket for Walla Walla County Commissioner. May 17, 1867. S. Hamilton listed as candidate for Walla Walla County Commissioner for the Union Party on page 3 column 1 of the May 17, 1867 Walla Walla Statesman. 4mb PDF file. Enlarge the image after you load it. 24) S. Hamilton: Union Party Candidate for Walla Walla County Commissioner, May 1867. Here's more interesting information on 'S. Hamilton.' I believe (it's an assertion at this point) this is a reference to Supplina Hamilton. S. Hamilton is a candidate on the Union Party Ticket (later to merge with the Republican Party) for Walla Walla County Commissioner in 1867. There were three open commissioner seats. The Union Party fielded their strongest candidates hoping to sweep the positions. S. Hamilton was running on the Union Ticket with S.M. Wait the founder of Waitsburg, WA and Supplina's future neighbor near Waitsburg. We know from US Census Records that Supplina's family lived near Lebanon, Linn County Oregon in 1860 (as a farmer) and near Aumsville in Marion County Oregon in 1870 (as a blacksmith). 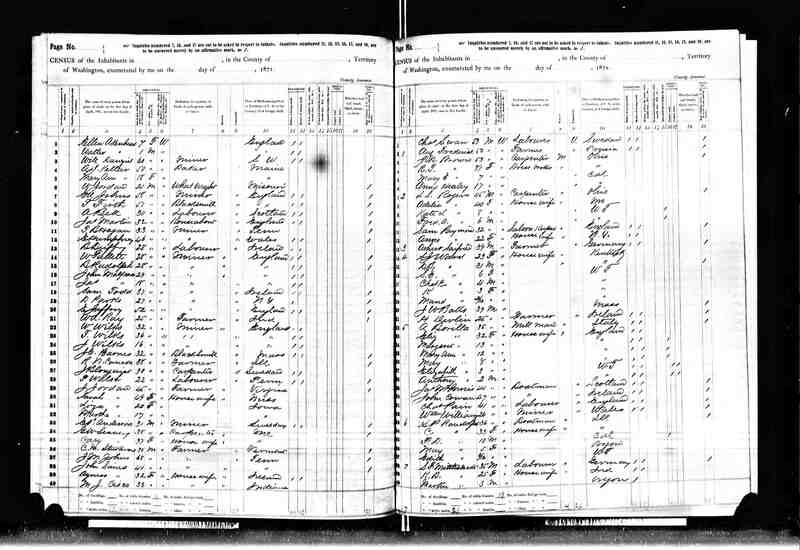 According to 1880 and 1900 US Census records their daugher Pyrene was born in Washington Territory in 1867. So, we know that Supplina and Jane were in Washington during the ten years between 1860 and 1870. We know from Disciples of Christ Records (to be published on the site shortly) that Supplina was associated with the church in Dixie, WA as early as 1867. It's not as unusual as it may seem that there would be migration too and from the Willamette and Walla Walla valleys. Walla Walla was most developed area in Washington Territory in this era. Seattle was still small and Spokane had yet to be founded. Early maps of the territories make this relationship clear. There was 'express' mail and coach service between Walla Walla and the Willamette Valley. This 4 megabyte PDF file is page 3 from the Walla Walla Statesman on May 31, 1867 (be sure to enlarge it once the PDF opens). S. Hamilton is mentioned on the Union Ticket near the top of column 1. S. Hamilton ultimately lost the election of 1867 (though S.M. Wait won a seat) and likely returned to Oregon for a time. 25) S. Hamilton: Lost on the Union Party Ticket for Walla Walla County Commissioner, June 1867. The Walla Walla County Election Results June 1867. Page 3 of the Walla Walla Statesman, Column 2. The Union/Republican ticket carried the majority on the County Commission with S.M. Wait and A. H. Reynolds winning seats. S. Hamilton (thought to be Supplina Hamilton) did not win. He is next found as a blacksmith in Aumsville, Oregon in 1870 before later returning to Washington for good by at least the mid-1870's. 26) S. Hamilton: Nominated by acclamation to run for Walla Walla County Commissioner on the Union Ticket. May 11, 1867. S. Hamilton nominated by acclamation for a run at Walla Walla County Commissioner on the Union Ticket at the Union (Republican) convention in Walla Walla on May 11, 1867. This is a 4mb PDF file. This is a page from the May 17, 1867 Walla Walla Statesman. The convention minutes are on page 2 column 3. 27) S. Hamilton: 'Respectable citizen' takes on the 'Roughs' and corrupt 'sore-heads' of frontier politics who use his good name. This is a very interesting column in the May 31, 1867 Walla Walla Stateman, page 2 column 1. The citizens are trying to clean up their frontier county of corruption and rid them of the 'roughs' that are extorting taxes for 'county government'. S. Hamilton (thought to be Supplina Hamilton) issues a statement refuting the 'sore-heads' attempt to leverage his good name as one who supports them. Could this slander have hurt S. Hamilton in the upcoming election for County Commissioner? Very likely. This is a 4mb PDF file. Besure to enlarge the file after opening. Pirena "Rena" Gilbert was a daughter of Supplina and Sarah Jane (Sumpter) Hamilton. She and her sister, Effie married the Gilbert brothers, Samuel S. and Walter W. Gilbert. Samuel S and Pirena "Rena" (Hamilton) Gilbert have left their Nez Perce, Idaho homestead and the company of their siblings, Walter W and Effie (Hamilton) Gilbert. Samuel and Pirena are living near Gilbert's extended family on 4th st. in Albany City, Oregon. Samuel lists his profession as, "Retail Merchant" and industry as "Groceries." His (brother?) Peter's family (also listed on the same page) appears to have handled the hard goods. Peter lists his profession as, "Retail Merchant" and his industry as, "House Farm ..??"